The Tarot Art project I would like to share today is two pieces that are meant to be companions to each other. The first, I like to call, Tarot Theater(front). (Tarot really is a bit like theater, isn’t it?) This is a journal to record readings, reactions and notes. The Second piece is a hard bound folder with clear sleeves glued inside to hold cards for various types of readings(back). Mine has 7 sleeves allowing me to do a 3 card, 4 card, 7 card, or any variation thereof type of reading. 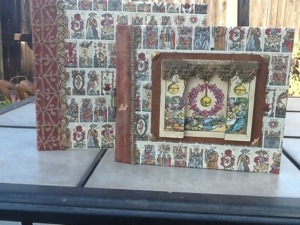 I made this piece hard bound so that I could open it to stand on its own on my alter to contemplate. The idea is to use them together. Pull your reading, leave it up on your space as long as needed, then record in the journal for later study. I am actually using the journal to make my own notes on the meanings of cards. After reading Mary Greer’s “21 Ways to Read a Tarot Card”, I was taken by all the impressions that one could derive from a single card and/or reading, I plan to use it as a working text for readings. Your art is amazing! I love the books themselves as well as the tarot concept. Keep up the good work!